We get it – the Easter Bunny gets tired sometimes. That’s why we’re here to help with some of the cutest goodies on this side of the egg hunt. Perfect for baskets, classroom gifts or parties, check out our favorite kid-friendly candy & games, sure to put a spring in their step and a smile on their faces! 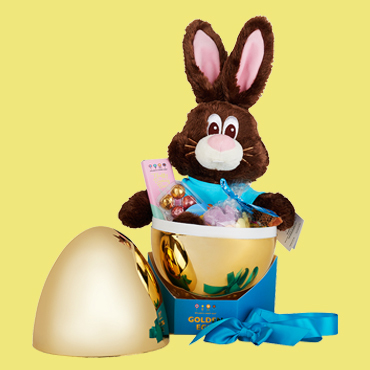 Technically, our oversized Golden Eggs could be their own basket. Stuffed with our plush Chocolate The Bunny, Blue Marshmallow Chocolate Fluffy Bunny Bar, chocolate chicks, gummy bunnies & more, it’s fun to crack open and even more fun to eat. As seen in Delish! As seen on ABC’s Shark Tank™, this is an Easter hit for a reason. Next-level egg decorating is in reach with this kit, complete with a template and eight toxic-free markers so kids can let their Easter imaginations run wild. This one’s for our candy corn lovers. We’re giving you another chance to enjoy this sweet pastel confection! And it totally delivers on the unique texture and marshmallow-y, caramel-y taste. Plus, who could resist this adorable bunny box? You can pick up these Easter treats in our stores or online – hop to it!